Free Thanksgiving coloring pictures are a good way to entertain children when parents and relatives prepare a meal. Coloring pictures is a good way to show the children the history of the holiday. There are lots of printable coloring pictures you can find. I've put together some links to make your search easy for you. While the turkey is roasting and meal preparation is keeping the adults busy let your children sit and color. You can display their works of art around the dining room. Won't they feel so proud with their special art works spread around the room during this special holiday where we all give thanks for the many blessings we have. 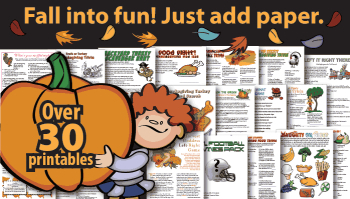 Here are some fun printable games for kids and adults with Turkey Day as the theme. Find out how to have some Thanksgiving fun with one or ten or thirty printable games. Now that's a nice start for your kids activities on Thanksgiving Day! Coloring pictures will help young children understand the meaning of Thanksgiving. While you are making a traditional Thanksgiving meal, your kids will be happily coloring away! You can find 40 more pages here.